After Triple Zero, another short story got published to Star Wars Insider . Odds provides the set-up for what was to come next with True Colours – introducing several factors that play a part in the whole plan to pull out from the war. When True Colours was published more than a year later, those elements were explored further. True Colours branches out the locations rather than sticking to just one, which fits with the growing cast and ever-expanding story. A lot of new locations are within this book, with the first look at Mandalore, and a return to Qiilura. With a lot of locations, more viewpoints are also explored. Walon Vau accompanies Delta to Mygeeto where he empties his family’s hoard of wealth. Omega have been sent to Gaftikar to help with the resistance there under the watchful eye of Null ARC A’den. Etain is on Qiilura helping with the removal of colonists on the Gurlanin homeworld, having been sent there by Skirata to hide her pregnancy. Meanwhile, Skirata, Ordo, and Mereel are on the hunt for Chief Kaminoan Scientist Ko Sai after she slipped away into hiding. Agent Besany Wennen trawls through government information looking for leads on just what the future holds for the Grand Army of the Republic. With four hotspots of action, there are at least one point of view per place. Having been introduced to him in Triple Zero, we get to explore Vau from his point of view. It’s mostly seeing just how similar he and Skirata are in their core values but showing how their different approaches still achieve similar results. After busting a gut to rescue him, Skirata is dumbfounded at just how much wealth the Vau family has – all now within the sack Vau had with him. This starts off the two finally putting aside their differences. That, and the growing hate they share of the Republic – which is something shown very well here. now includes Etain again after the angered exchange the two had at the end of Triple Zero when Etain had mentioned her pregnancy. Things are on much friendlier ground with the two of them after a few months of being separated and the solid irreversible change that the baby is. Etain is still struggling with her emotions, with her hormones making that struggle even worse. Jusik doesn’t get a viewpoint, but he is a vital part of this story as he plays both sides. After Mygeeto, Delta are put on the same mission that Skirata is pursuing – hunting Ko Sai. Not only does he go against orders and informs Skirata and co. exactly what’s going on, he also slows Delta down to allow Skirata to capture the Kaminoan first. He does exactly what he feels is right, and that builds to what happens at the end. It also plays parallel with how Etain feels, but she goes about it in a different way despite the fact she now has more to lose. Sev is our view of Delta, and it is from his viewpoint how we see that Vau’s methods of training soldiers probably aren’t the best. Mygeeto rests heavy with Sev as he feels they failed Vau. That constant need to be perfect is strong with them all, and they all have to be feeling the failure in some way. That focuses them on the next job at hand, but maybe it’s just Sev who also feels that he would never be able to look at Vau without feeling guilty and radiating that failure like a beacon. The end is quite raw feeling for all involved, as it speaks to the injustice of the system. The assault on Gaftikar ends early for Omega when an explosion rips through a building and puts Fi in a coma. Omega do everything they could, Skirata bends a lot of rules, but in the end Fi is officially dead. Unofficially, he is being Jedi mind-healed by Jusik until he breaks out of the coma in the back room of Captain Jaller Obrim’s residence. It hurts for everyone because it is someone they know. Because it speaks to what they all know. That the Republic isn’t worth it. Mandalore is explored in this book, giving us a look at the base of operations of Skirata’s extended family that is currently under construction with its finishing touches. Mandalore becomes important in the next two books, so having the introduction here is worth it to see the bastion grow as a home and explore the wider world of Mandalore. True Colours explores the darker side of the Republic that becomes very important when hitting Order 66, as that gives an interesting take on the events that happen during the period of Revenge of the Sith. 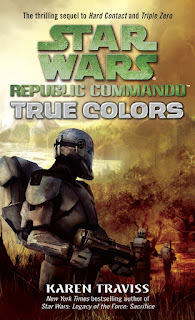 That’s for the next review though, with True Colours exploring a lot, with many great interactions between the characters and the world, and making the necessary preparations for a whole lot of growth to this story. The final of these Future of Mario Kart posts have come back around to looking at tracks that could be featured within a new game. Retro tracks started us off, and I’ve even looked a bit at crossover tracks, but now is the time where completely new tracks have to be considered. Now, I’m not going in depth with these. No massive details about every turn and glide point. This is just to give general ideas as per usual. Just as with the retro tracks, the list below shows how the tracks would be set out with the guide of what they contain. Luigi has had three Circuit tracks to start off the cups, starting from Mario Kart 64. After a Luigi Circuit featuring as the starting track, a different Circuit would feature in the next game. Mario Kart 8 broke this pattern with Mario Kart Stadium, but to be fair the only Circuit tracks in the game were both Mario Circuits. I can certainly understand the want to get away from the Circuit name, as it allows track names to be their own thing rather than be tied to a naming theme. The only one which wouldn’t change is Mario Circuit – which is a staple as much as Bowser’s Castle and Rainbow Road. For that first track then, I’m going for the name of Luigi’s Balloon World – and that won’t be the only tie to Odyssey on display with these tracks. It would be a simple design – as all first tracks are – tracing out two balloons side by side with their strings together. The overall look to the track would be similar to that of Luigi’s first Circuit track, with a lot of hot-air balloons in the sky. Yoshi hasn’t seen a new track in Mario Kart since the DS with Yoshi Falls. Rather than name this specifically after Yoshi, I’m instead naming this after the hub of Woolly World. Craft Island is a name I am expecting to be used again in Yoshi Crafted World, but even if not, it can still contain elements within the track considering the crafted feel of the levels are still there. Combining the wool with the other craft materials would make for some interesting design. Mario Circuit has always featured Peach’s Castle in some form – with Mario Kart 7 even giving a brief inside view. What if it was mostly based on the inside, though? You could say that hardly qualifies as a Mario Circuit if that’s the case, but you can hardly change the name of a staple track, can you? Now, imagine the layout of Peach’s Castle from Super Mario 64. You’d start down in the basement, driving through it to reach the next level, reach the winding stairs and drift up them, drive through the window and glide down to where the warp pipe appeared, follow the path to the front of the castle, then dive down into the moat and back to the start line. The track has circuit in its name, so having it be a marathon track is out of the question. But the two Wuhu Loops managed just fine, so the ability to explore more of the castle would be fun to make a track layout from, so long as the start and finish were still connected. And speaking of marathon tracks, Rainbow Road needs to return to being one, and not a long loop either. Make the Road name of Rainbow Road actually mean something and have it be a twisty long stretch of track. Half-loops would be a good idea to implement along with corkscrews to really give the feeling of randomness that country roads provide – but this one is IN SPACE. To give a new character a track, I’m going with Chargin’ Chasers for not only the new character feel but also a new place to explore. Chargin’ Chucks look like they’re ready for some sporting action. Mario and co. have already been having sporting fun in games, so here is a race track for them to drive through. It might seem a little boring to have a regular sporting stadium as a track, but this one would have that special Mario touch. In the fact it’s based up in the clouds with a load of vines making up the perimeter of the stadium. A clear pipe is also a part of the track that breaks through the clouds and gives a very high view of the ground below. Sunset Snowdrift would be a snow-covered track set to the orange glows of a sunset. Skylit Heights would be based on New Donk City from Odyssey during the night. It would involve driving around the towers and buildings, gliding or jumping between different ones. This would be a marathon track. Starshine Sands would be a track similar in visual style to the Starshine Beach Galaxy of Mario Galaxy 2. Jungle Jitter uses the name of one of the level themes of Donkey Kong Country 3 and bases a track on the visual style of the level it is used with. Princess Peach gets her own track again. Titled Peach Paradise, it is a tropical resort that features a pool and a water slide. More than that, though, paintings will transport players to other areas of the resort such as the tropical forest, through a small section of the catering area [which would be very food based], and even into the sky to look down upon all of the resort before crashing down back into the pool. Other areas of the resort could also be explored, or even other resorts in completely different locations, as there’s a lot that could be done with the theme if managed right. Airship Firefleet features numerous airships, and much the same as Airship Fortress from Mario Kart DS, features airships. Not just one this time, but a lot of them. And it’s a warzone, with various airships firing cannons at each other. The racers will be fired out of one of those cannons and will transfer between a few of the airships during the race. Painted Platforms is an attempt at making changes per lap in the fact that different colours will be splashed over the platforms that make up the circuit, with dark colours slowing racers down. There would also be branching paths, so making a quick judgement based on which has the most dark coloured paint is needed to do well. Forgotten Falls might use a visual style similar to the Lost Kingdom from Odyssey, but is more its own thing. Yes, it features dinosaurs, but it would also feature those ‘forgotten’ characters and enemies and even locations that haven’t appeared for quite some time, or at least have hardly featured in recent times. Bowser’s Castle is the Bowser’s Castle, full of lava and statues of the great Koopa himself. Though that statue isn’t just for show, as racers will fly into its mouth and drop down it. They’ll also be driving up the backside of it. In fact, why not go the whole way and make the Bowser statue the castle? Now, there will also be two new tracks on Wuhu Island. I haven’t named these, but they would explore new areas of the island that weren’t featured in Mario Kart 7. One of the two would go to the golfing area – Wedge Island, which is quite an area to explore. As for why there’s two new Wuhu tracks as well as the two old ones… I left this feature specifically for this moment, but here it is. Mario Kart 7 allowed people to create a cup of four tracks that would be shared with people via Streetpass. I’m proposing the same thing be implemented in this new game, but tied to your profile so anyone who races against you has access to your personal cup. Your Mii would race in this cup just like in Mario Kart 7. And there you have it. Sixteen new tracks that could be used in a new Mario Kart. There are plenty of other ideas that could be used – for features, characters, or tracks. But for me, I’m done with ideas for Mario Kart. I’ve got a number of ideas for another series that just got recently announced in the Nintendo Direct – and if you read my thoughts on that, you’ll probably know that the new ideas generation series is looking at Animal Crossing. Forwarding the Village is the tentative name I have for it, so be on the lookout for it starting next month. Well, that was a content packed Direct. And it all started with Luigi’s Mansion. While I’m not big on the series, it was still great to see a third game announced as coming to the Switch. The original game being ported to the 3DS was also shown off with a new local multiplayer mode. Other 3DS games included Kirby’s Epic Yarn going Extra Epic with a port, Mario and Luigi: Bowser’s Inside Story + Bowser Jr.’s Journey being shown off and given a date of 25-Jan, and Yo-Kai Watch Blasters getting new content at the end of the month. Splatoon 2 is getting new content in Version 4. It looks as though some sort of 1vs100 mode is being added, so that should be interesting. Along with new styles and new weapons, it also looks as though there might be new things added to the solo missions and Salmon Run. Mega Man 11 was shown off, Capcom Beat ‘em Up Bundle was announced with seven classic games being available for it, Katamari Damacy is being remastered for Switch, Diablo 3: Eternal is coming, as is Cities Skylines. Mario Tennis Aces is getting four new characters, two of which I’m happy to be seeing. Paratroopa was one of my favourites in Mario Kart: Double Dash, and Petey Piranha was fun to race with, so getting them in Tennis Aces when both have seemingly dropped off the radar somewhat is a surprise. The other two are Birdo and Shy Guy. A decent surprise in a deluxe version of New Super Mario Bros. U with New Super Luigi U included. The only two of these I’ve played are the DS and Wii games, and while I’ve got my eye on this, 2D platformers are not for me. I’ve tried countless times, but it never feels right with me. Yoshi’s new game has appeared for the first time in ages, and it certainly looks a lot better than it did during E3 2017. Crafted World is coming sometime in the spring, and it certainly has taken the crafted feel to the maximum. Pokémon Let’s Go: Pikachu / Eevee featured, as did Super Mario Party, and Starlink: Battle For Atlas. A sizzle reel included Warframe, Just Dance, FIFA, NBA, Team Sonic Racing, and LEGO DC Super-Villains. The World Ends With You Final Remix and the Xenoblade 2 DLC featured as well, along with Daemon x Machina. Tabletop games are being brought to Switch via Asmodee Digital. Real tabletop games in video game form. Seems like it could provide some fun. Civilization VI is also coming to Switch with four player local play. Game Freak are also building a new RPG in the form of Town [Working Title] that keeps the focus exclusively in one village. I’ve got my eye on this. Before the end, a Final Fantasy explosion happened. Crystal Chronicles is being remastered for Switch, and XV Pocket Edition HD is already out. These two we knew of. What we didn’t know of was World of Final Fantasy Maxima, Chocobo’s Mystery Dungeon, VII, IX, X, and X-2. A lot of Final Fantasy, then. Last was expected. Super Smash Bros. Ultimate content. After the special edition Switch was announced, Isabelle was shown in her office. She got an invite. TO SMASH! Yup, Isabelle is in Smash Ultimate. After showing her off in-game, the trailer shows Tom Nook. Surely he can’t be in Smash, too? Nope, ANIMAL CROSSING IS COMING IN 2019 FOR SWITCH! I just wanted to know it was coming, and it is. The Direct was full of content, running at a very brisk pace to show it all off, and the announcements… I can’t choose what I liked the best. Well, Animal Crossing of course, but aside from that there was a lot shown off. Nintendo Switch Online had a charming trailer featuring Mario characters, though it didn’t show much off we didn’t already know. Those NES Joy-Con are good for people who like playing with them. It was enjoyable, and thanks to the announcement of Animal Crossing, I know I’ll be in for a good time next year. And with that announcement, I can announce this early. The Future of Mario Kart series on this blog is ending, with the new series of ideas generation looking at Animal Crossing and how that can grow. So that was the Direct of 13-September. I’ve had my say, so what did you like best from it? The Mario Kart Monday videos have started up, but the other series I was planning isn’t able to start up. See, what I had planned was a look at Forza Horizon 3 and its expansions along with Horizon 2 before Horizon 4 released. I could push on and get those videos done, but there’s just one factor to take into account. They won’t look good. My Xbox One hasn’t lasted well in the heatwave that struck the UK – it wouldn’t do with near five-hour sessions almost every day – so it’s struggling to run games at the minute. I’m getting a replacement in the form of the Forza Xbox One X bundle, which is out the same day the game releases. Hopefully there will be more Mario Kart Monday videos this month, as I’ve held out so I could test how a video looks with the full sixteen races. But forgot to save the first four races to favourites to be able to do such a thing. Even if I forget to do that, there will be two Mario Kart Monday videos up on Youtube. There will be more reviews as the next in the Republic Commando series gets looked at, and Solo: A Star Wars Story finishes my look at all the Star Wars films – at least until I get onto The Clone Wars. I also aim to get that final Look Inside the Morphing Grid posted up this month, as it is now almost a year since it originally should have gone up. The massive amount of delays with that series is less due to the franchise itself and more thanks to my lethargy I’ve been suffering due to a lack of energy. I’m not going in-depth with the details, but I have a problem in my feet which has caused my body to use up more energy than it needs to, and since I’ve ignored it for ten years or more it has caused a problem that just seems to be slowly deteriorating. I’m getting it sorted, but it is taking time. And it is that reason that all the delays have happened. I’m taking things slow, and when I feel I can I’m putting everything into working. Anything new will be posted about on social media – which now includes Twitter – along with when all of the stuff stated here releases. I also hope you can understand the situation I’m in with my health. I’ve been dedicated to this label for more than five years, and wouldn’t ever want to close it.